Warning – do no check out this place if you are on a diet. 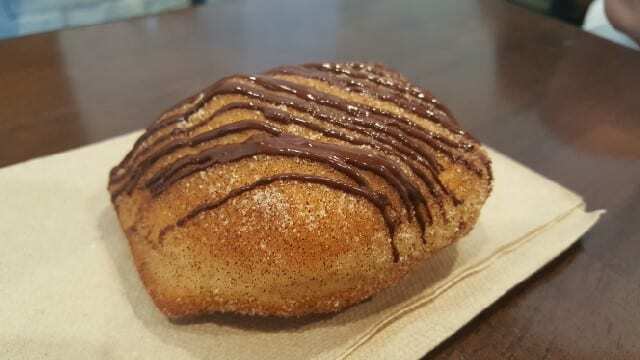 However, if you are not on a diet and want to indulge, head to Astro Doughnuts & Fried Chicken. 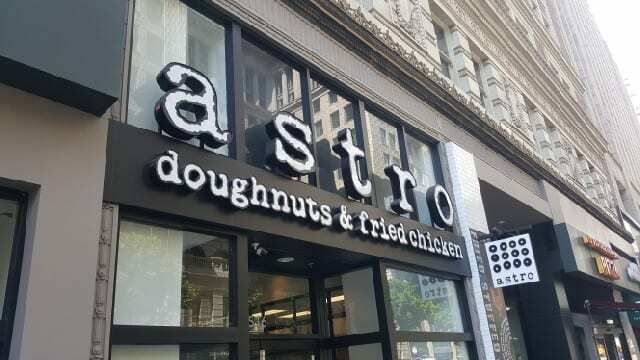 Originally from Washington DC, Astro Doughnuts & Fried Chicken opened their first location outside of the D.C. area in downtown Los Angeles. And like the name, that is exactly what they serve, the two American classic dishes – fried chicken and doughnuts. 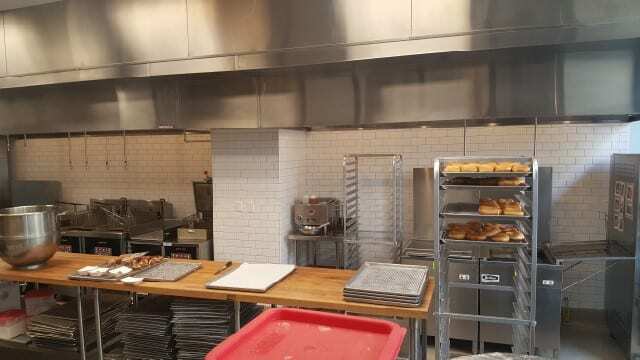 Everything at Astro Doughnuts & Fried Chicken is made from scratch daily. And everything is super tasty! My friend and I met for lunch and decided to start with the savory dishes – fried chicken. The chicken meat is tender and the skin and batter are crispy and delicious. 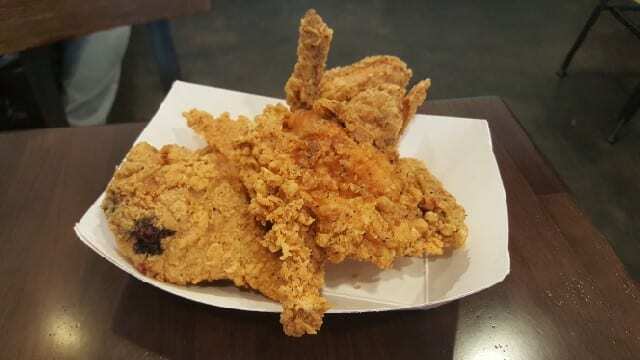 This is really really really good fried chicken. Orders are available in 2, 4 or 8 pieces and chicken fingers are available as well. Fried chicken can also come in a sandwich where you pick the type of bun you like (savory doughnut, potato roll, cheddar biscuit or old bay doughnut), the sauce you like (blue cheese, sriracha mayo, sriracha buffalo, honey mustard, ranch and BBQ) and any add-ons you might want to include (honey butter, cheese, kimchi cole slaw, pickles, bacon, farm fresh egg, sausage gravy or pickled jalapenos). 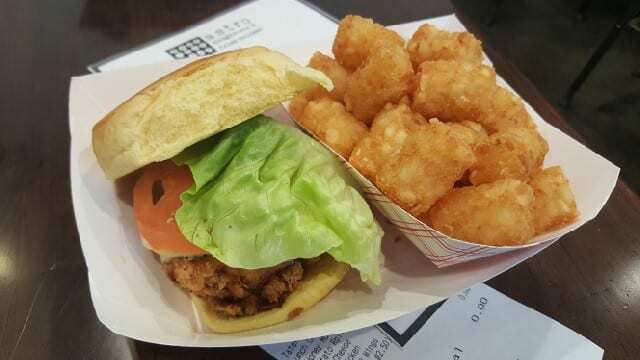 We went with a fried chicken sandwich on a potato roll with honey mustard and cheese, as well as a side of crunchy tater tots. Kimchi coleslaw and cheddar biscuits are also available on the side but we decided to save room for doughnuts. 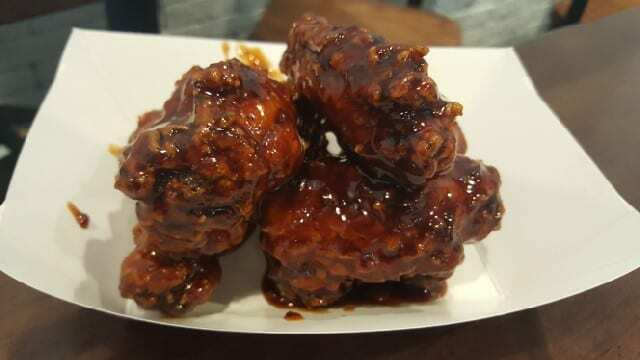 We also tried a new menu on the item – fried chicken wings with Korean BBQ sauce. The sauce had a little kick to it and the wings were pretty good but a little heavy on the sauce. After enjoying the savory fried chicken, it was time to satisfy our sweet tooths with the doughnuts. 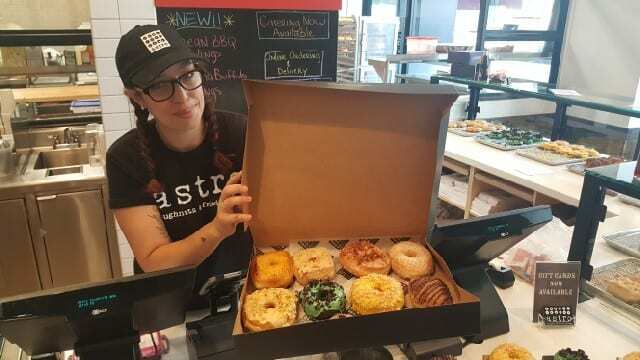 Astro Doughnuts & Fried Chicken offers a choice of eight doughnuts every day. Four of the doughnuts are standards that can be found year-round. 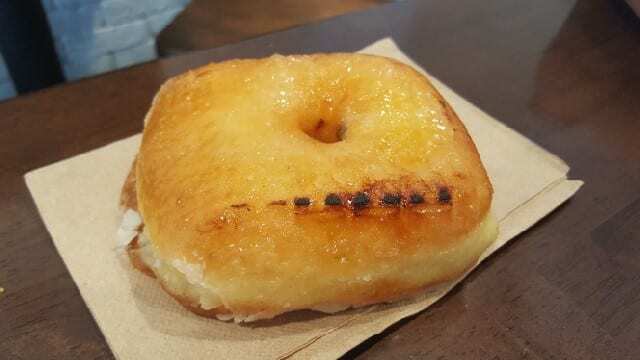 The Vanilla Glaze is a classic doughnut and what I loved about it was the doughiness of the doughnut. Also, it is sweet but not over-the-top that it gives you a toothache. The Creme Brulee was really cool. The outside was covered with a hard sugar shell. Just like the dessert, you had to tap really hard on it to crack it. 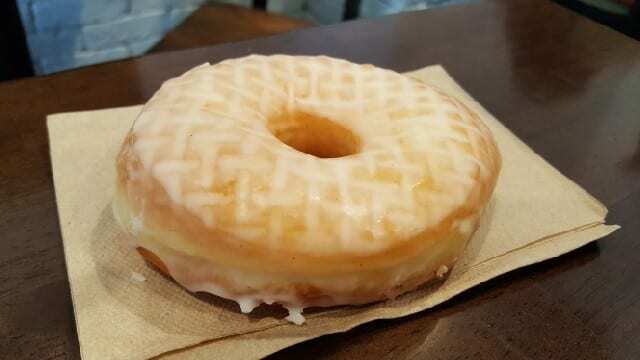 Inside the doughnut is filled with cream. The cream had a nice flavor but we agreed that we wished it had had a little thicker consistency. When we bit into the PB&J, we were surprised by the subtly of the peanut butter and jelly. The flavors were definitely there but they were very natural tasting without all the stickiness. The jelly was not too sweet and the crushed peanut on top added a nice touch of texture. The Maple Bacon was another favorite. 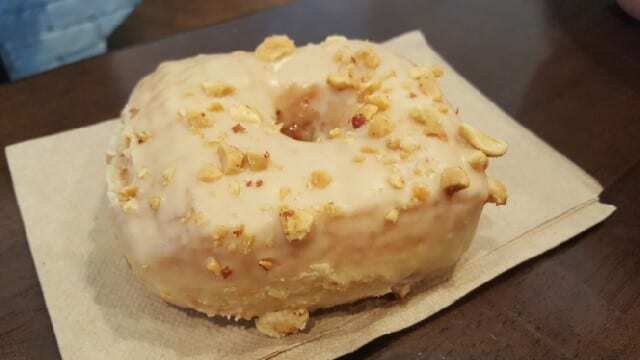 Unlike other maple bacon doughnuts that I have tried where the sweet maple is what you taste over the bacon, with this doughnut, the bacon flavor was front and center. 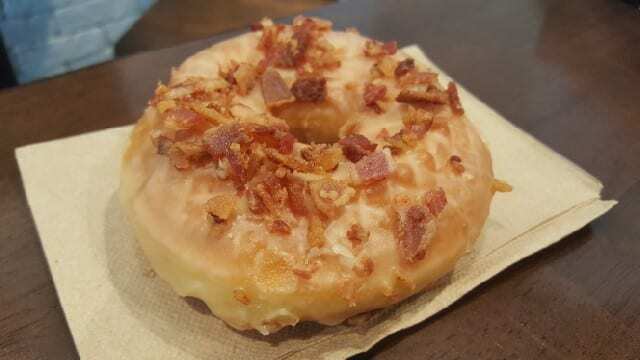 We had to wonder if this doughnut might be cooked in bacon fat because the bacon flavor was a natural part of the doughnut. 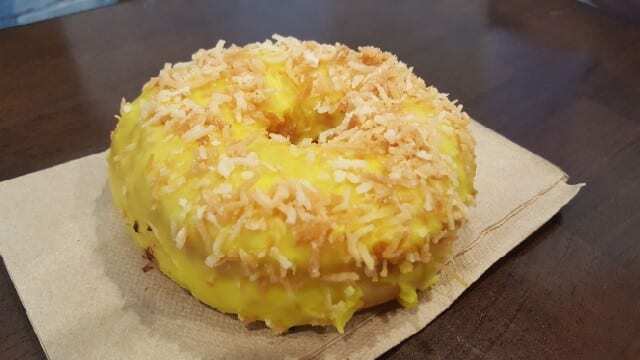 In addition to the four standard doughnuts, each month Astro Doughnuts & Fried Chicken offers four seasonal flavors. When I went, the four flavors were Yuzu Toasted Coconut, Summer Sweet Corn, Mint Cookies & Cream and Cannoli. 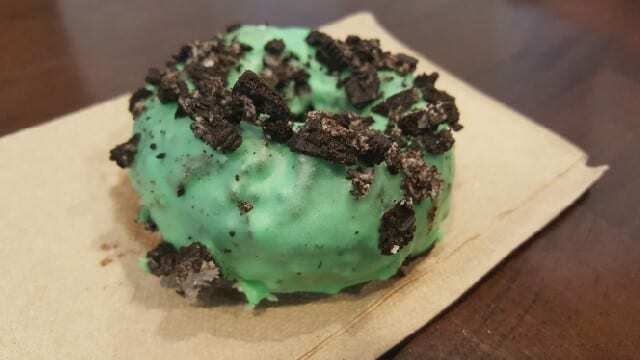 The Mint Cookie & Cream was a cake based chocolate doughnut and the Cannoli tasted like Mexican chocolate. The Yuzu and Coconut was good although I would have liked a little more yuzu flavor. And the Summer Sweet Corn was incredible. It was like buttered popcorn with kernals of corn and popcorn on top. I hope they bring this one back again! Everything was so tasty that I cannot wait to go back and try the new doughnut flavors. I guess when it comes to Astro Doughnuts & Fried Chicken, I say screw the diet! 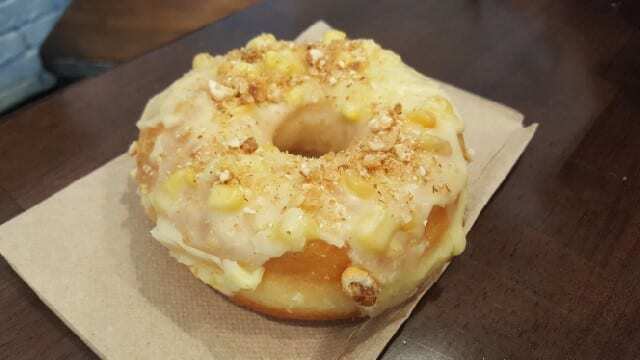 This entry was posted in Food and tagged Astro Doughnuts & Fried Chicken, Astro Doughnuts and Fried Chicken, doughnuts, downtown LA, food, fried chicken, fried chicken sandwich by Allison Levine.